Do you tired for kicking pig in angry bird? Do you want build your building to cover some one? 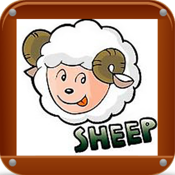 Yes, Lucky Sheep is nice game, you need cover the sheep using given boxes, don't let the wolf hit your sheep. Let show your skill in building with your friend. Will explosion when be hit. 3. Make sure you can protecte Sheep. 4. Builded and tap go and enjoy it.